I count myself as having been dealt a reasonable hand by the good Lord; despite the recession, the two companies I am involved with are still going (in itself an achievement these days). I have a lovely family and support the best football team in the world, Leyton Orient (it’s all relative). More to the point, I live about 1.5km from my office and walk in every day past huddles of folk at bus stops either on their way direct to work or, perish the thought, to the underground to be ‘sardined’ to the office. Walking there and back five or six days a week however, has taught me something I had never given much thought to; the level of noise pollution in London is unbearable. OK, you expect unbearable noise on the Euston Road during peak times; but not on roads which are generally ‘quiet’ by London standards. And herein lies the problem, the noise levels are not generated by the volume of traffic but rather by the volume level of individual drivers. A white van is not by definition a dangerous beast. But when the driver has been forced to stop at a zebra crossing to enable a mother with toddler to cross, and is angry by being held up for five seconds and then sets off as if he were in pole position at Le Mans, the beast becomes a behemoth if you happen to be walking next to the incident. A group of schoolchildren may seem an innocuous target but do I really have to listen to their ‘conversation’ from a distance; and the more the distance is narrowed the more unbearable it is. And why is it that the most powerful motorbikes make the least noise of their fraternity? A rider with the mother of all exhausts knows how to control their machine in populated areas whereas the ubiquitous pizza delivery chap on a machine that should be hanging in a motorbike museum rides at 60kmh in second gear. The noise is simply intolerable. This literally orchestrated attack on my senses is but an hors d’oeuvres in preparation for the final ear drum splitter – the emergency service siren. While I feel for the poor soul in the back of the ambulance who needs to get to hospital quickly; is it fair to ask him or her to arrive at A&E with split ear drums? Would the police car not get through stationary traffic at the same speed if the siren was down a notch? The truth is that society’s aggression is manifested in many different ways but you never hear anyone talking about noise pollution. Maybe it’s because they can’t hear themselves think. For Gary Reinbach the NHS was hardly a cradle to the grave concept. The 22-year-old from Essex had started drinking at 13; ten years later and with one of the worst cases of cirrhosis his doctors had dealt with, he was basically left to die in a hospital bed. 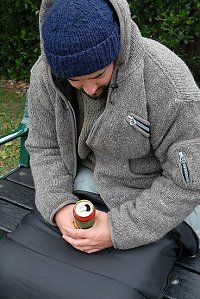 Strict NHS guidelines determine that before a person is able to undergo a transplant he must stay sober for six months. Twenty two is an apt age in Gary’s case because he was literally in Catch 22. Too ill to leave the hospital to attempt rehabilitation he was unable to benefit from medical care inside it and died. It may well be that there is a shortage of donors and that all forms of treatment are rationalised. And clearly Gary’s lifestyle, heavily dependant on drink, was the ultimate cause of his death. But when the NHS was set up the government asked us to buy into the concept of ‘we pay our taxes, you keep us well’. We were not asked to live a certain way, despite the millions of pounds of government money going into the coffers of trendy ad agencies advising us to do just that. The NHS cannot have it all ways it chooses. If resources have to be rationed then we the public can make a judgement on whether we wish to minimise the risks inherent in unhealthy lifestyles. But it’s the start of a slippery slope that matches the Winter Olympics bobsleigh course when the government, through one of its most iconic departments, puts the proverbial black cap on because a patient does not match one part of the NHS’s strict criteria for receiving medical care. There is of course a precedent for this kind of rationing of health care. For Gary Reinbach in England 2009 read adults with a learning or physical disability in Germany circa 1938. It’s the little things which put the bigger things into perspective. Last week two minor events in my life brought home how precious and precarious life can be; and how luck and fate plays a part. First to a hospital in north London to visit a friend from the chess team I play for who was admitted the previous weekend with a serious complaint and who was, and is, very poorly. Seeing a guy who two weeks before was playing alongside me in the National Chess League now barely able to walk to the lavatory was a real shock. The daily grind of work, making ends meet and hoping there is enough left at the end of the month for the odd visit to a restaurant suddenly becomes meaningless when you see a person you know well suffering like this. Then the next evening to interview a potential model for Care images (actually her mother) as the model is a five-year-old disabled girl. 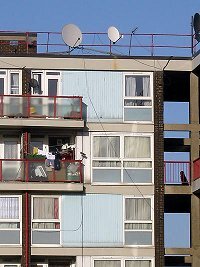 They live in a council tower block on one of the higher floors and as I waited for the lift to come down I thought to myself; ‘what would happen in the event of a fire?’ The answer, chillingly, stared at me from the TV screens on Friday as news of the tower-block tragedy in Camberwell came through. We are caught up in the minutiae of our lives, especially the economic climate. As long as everything is OK for me, then why should I worry about anyone else? This is a philosophy which brought great success to one Margaret Thatcher and is one that has permeated all aspects of our society. Maybe we need to take a step back, draw breath and take stock of what kind of country we have become. One minute, two happy families were busy with the minutiae of their lives in a tower block, two hours later they were trapped, unable to escape the flames. I may well be all right Jack, but what about those people who are not?